Let me just say, I brought these cookies with me to work...and people were coming back for seconds! 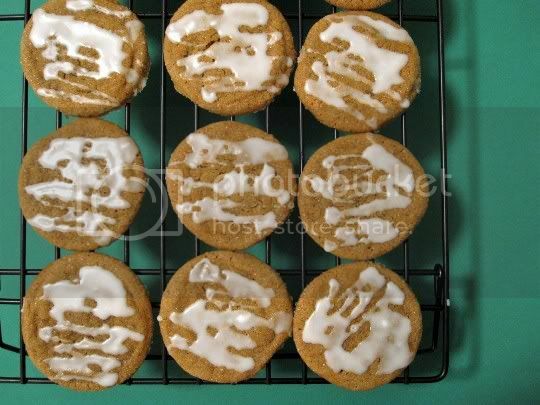 This is probably the most amazing ginger or spice-like cookie you'll ever eat, complete with a lemony sugary glaze. Soft, chewy, sweet, salty, spicy...everything you could ask for in a perfect cookie. The "spice" in these cookies is ginger, cinnamon, nutmeg, and cloves (which leave a cool, almost minty flavor in your mouth that goes quite well with the tangy glaze). The key to the texture of these cookies is baking them for just the right amount of time. The recipe suggests 10 minutes, but I gave them an extra minute just for the sake of my faulty-ish oven. Fresh out of the oven, they should be firm to the touch (but soft enough that you want to only lightly touch them), puffy, and golden brown. Set on cooling racks, they will continue to "cook" and flatten and firm up. You'll probably have to bake these in two batches, so keep the remaining dough in the fridge until you're ready. Overall, these are your standard cookie dough instructions (dry ingredients into creamed butter-sugar mixture), and I'd make no changes. The glaze, however, needs about an extra tablespoon of water to make it thin enough for drizzling; otherwise, it's a bit too sticky and thick. OMG! These were so good! I can't wait to have my own personal batch.... Yummy!! !